Hurricane Sandy Relief Effort in Long Beach – Sat, Nov 17th, 2012! Surfrider –Central Long Island Chapter in coordination with Surfrider-NYC, the Long Beach Surfer’s Association, Bryan Murphy’s “Sandy Help LB”, Tyler Breuer’s SMASH, NYNJSurf.com and other local organizations have volunteers available to help! Do you or someone you know need help emptying their home? Saturday, November 17th, 2012 from 10AM on, teams of volunteers will be out to help! We have the people, all we need is to know where to go – we can’t promise to help everyone, but we will try our best! We have a partial list of homes and people who need help – to get your name added to the list, simply text your information to 516 672-0195 or go online at Bryan Murphy’s www.facebook.com/SandyHelpLb page and log your request! 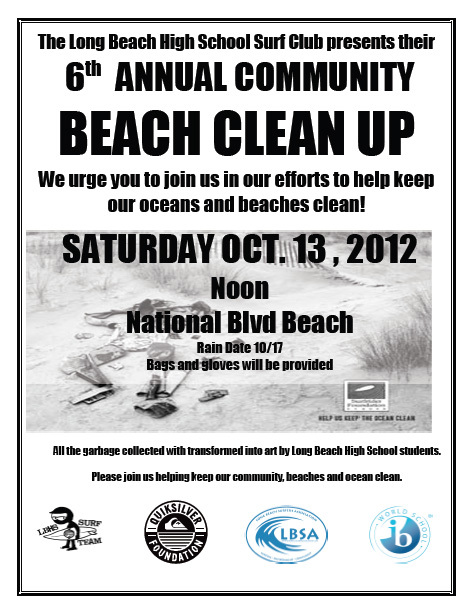 Join the LBHS Surf Team for Beach Cleanup Day – Saturday, October 13th, 2012! Check this! The first 100 people to show will get a tee shirt - and all the garbage collected will be transformed into art by the HS art students! 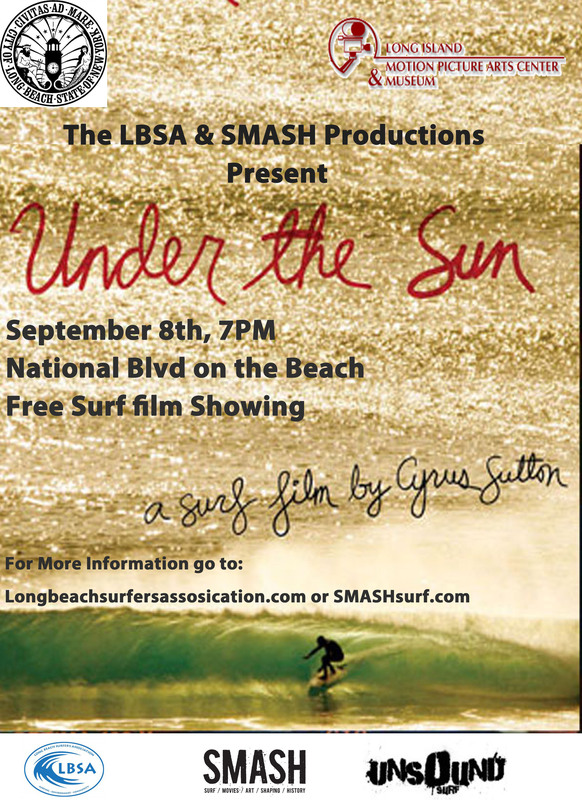 LBSA and SMASH present “Under the Sun” on National Blvd Beach – Saturday Evening, Sept 8th, 2012! Come out for another great surf movie night on the beach! The City of Long Beach hosts the 2nd “surf movie on the beach” event at dusk on Saturday, September 8th on National Beach. “Under The Sun”, a film by Emmy award-winning director Cyrus Sutton will make its’ debut at this free public screening courtesy of SMASH (Surf /Movies/Art/Shaping/History) and in collaboration with the Long Beach Surfers Association, the Long Island Motion Picture Arts Center & Museum (with a grant from Legislator Denise Ford) and Artists in Partnership, Inc. The film is a documentary shot in Byron Bay and the Gold Coast, Australia and produced with support from Ubiquity Records. Often dark and subversive, this brilliant super 16mm film explores the roots of surfing commercialism while striking a compelling story through stunning surfing shots and never-before-seen 70’s footage. Starring: Dave Rastovich, Nat Young, Beau Young, Rabbit Bartholomew, and Dean Morrison. Grab your beach chairs and blankets, bring your family and friends and come down to National Beach on Friday evening, August 17th, 2012 to see Soul Surfer – the Bethany Hamilton story! Events start at 6PM (join us for a surf! ), film starts at 8:30! LBSA/Earth Arts Sidewalk Surf Art Contest – Sunday, July 8th, 2012! 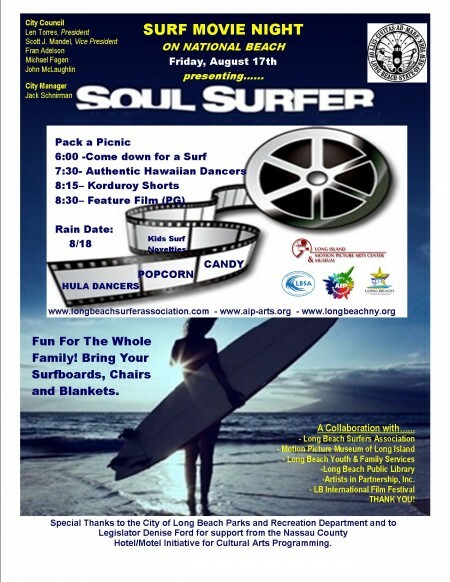 Come out for Surf Movie Night at the LB Cinema – Friday, May 18th, 2012! The Long Beach Surfer's Association and SMASH productions present Surf Movie Night's Premiere of "LOST AND FOUND", hosted by Sundown Surf Shop! The Long Beach Surfing Association & SMASH (Surf /Movies/Art/Shaping/History) presents Surf Movie Night’s premiere of Lost & Found by Doug Walker at the Long Beach Cinema on Friday May 18th, 7PM hosted by Sundown Surf Shop. The film traces back the stories from 30,000 lost film negatives shot of some of the 70’s best and well known surfers. Storyline: In 2007 Doug Walker found roughly 30,000 missing film negatives from the Surfing Magazine archive at a Pasadena swap meet. After spending 1 year organizing the collection, Walker decided to reunite them with their original sources and subjects. He figured there just might be a story there. For the last 3+ years Doug Walker has been capturing stories that if not told will be lost. Starring Aaron Chang, Dan Merkel, Bob Barbour, Bernie Baker, Buttons, Greg Weaver, Jock Sutherland, Rory Russell, Larry Bertlemann, Bobby Owens, Duncan Campbell & Gerry Lopez. View the trailer here and feel the stoke! Non-Members $20 – Includes Ticket, Popcorn, Drink and optional LBSA Lifetime Membership! Sundown Surf Shop will be giving away raffle items and other goodies. Next LBSA Meeting: Wednesday, June 13th, 2012 at the West School! The next meeting of the Long Beach Surfer's Association is Wedneday evening June 13th, 2012 at 7:30PM at Long Beach High School! There's tons on the agenda, including roundups on our just completed events (Spring Surf Day in Long Beach on May 12th, Surf Movie Night on May 18th, Reynolds Channel Cleanup on the 19th), updates on the Surf Beach sign, a continued discussion on how the LBSA can assist the city to insure all visiting surfers obtain beach passes, and plans for our upcoming summer outdoor beach BBQ and Family Days!